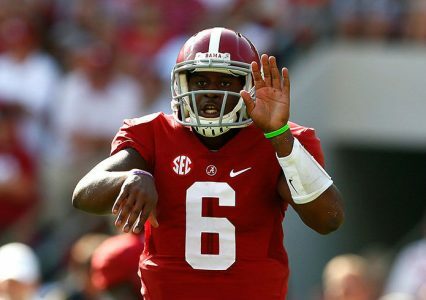 Play On: Alabama Crimson Tide -14.5 points. Roll Tide fans everywhere are in a frenzy after winning the Iron Bowl with a huge second half comeback against Auburn, but some holes in the defense were exposed there allowing 44 points to a good Auburn team. One thing that is perplexing is the fact that I am unsure whether Missouri, who returns for the second year in this SEC title game, can exploit Bama’s weaknesses. Missouri has been an enigma wrapped in a riddle all season long for me, and I live in Kansas City and am surrounded by Mizzou fans at all times and have seen all their games, many of them they just flat out won ugly. One simply cannot ignore 2 home losses by Mizzou including a loss to Big 10 bottom feeder Indiana and a 34-0 waxing in their home stadium to Georgia without RB Todd Gurley. Mizzou can be exposed right up the middle against a very tough Bama OL and strong running game and dual threat QB Blake Sims. One thing is for certain out of last week’s results, Arkansas had a big OL and DL, and Mizzou stood toe to toe with them which was surprising to me, in a come from behind home win last Saturday by 7 points. The one consistent thing about Missouri all year is that they find ways to win but I do not think that is enough against the top ranked team in the nation. Mizzou QB Mauk has finally shown some signs of the brilliance he displayed last year, but it has been an up and down year for him. In a spread attack in the SEC against SEC defenses not as good as Alabama’s, they only rank 98th in the nation in passing. The Tigers are without three of their WR studs they had last year and it showed early in the season but one thing Mizzou has done is improve every week this season and learned from their losses, and Gary Pinkel is a good football coach and has experience in big games, none the less he has yet to win a conference championship, and that includes dating back to the Big 12 days against the likes of Oklahoma, Nebraska and Texas. Is Missouri due, yes they are, but this is the toughest task in College Football this weekend, to beat Alabama in the heart of Dixie in Atlanta. The fact Auburn played them wire to wire is not an advantage for Missouri, because Nick Saban will have his team focused after a near debacle, versus trying to keep their head out of the clouds after a blowout win. Last year Mizzou got shredded by RB Tre Mason in the SEC Title game (he set an SEC record), but this year they face a different threat in WR Amari Cooper for Alabama, as it seems he is uncoverable and can bring any secondary to their knees and in man to man coverage, and with no safety over the top for help, he is deadly, just ask Auburn. Mizzou has serious issues in their secondary with matchups here as speed kills and I think Bama has more of it at skill positions than Mizzou does. I think the speed issue will be a deciding factor in this game, and Mizzou has no answer for WR Cooper (no one does). Despite a good Mizzou pass rush and 2 very active defensive ends, QB Blake Sims will not stay in the pocket under pressure and has the ability to scramble and buy time, break big runs, convert third downs, and stretch the field against a very suspect LB unit of the Tigers. Mizzou cannot trade punches on the scoreboard here and they cannot shut down Bama altogether which would rightfully concern anyone who is willing to take the points here. The Crimson Tide have allowed over 23 points on defense only once in their last 10 games and that was last week against an offense better than the Tigers have. Considering strength of schedule is crucial here and Alabama has ran the gauntlet, and the one common opponent here to look at is Texas A&M, Mizzou beat them by 7 and Bama rolled them by a score of 59-0 and had third stringers in at the start of the third quarter. There is no argument that the Tigers side of the SEC schedule is very soft and the best team they played all year was Georgia and they got beaten badly. Mizzou’s spread attack is not as good as previous editions and their greatest strength is running it and using RB Murphy to break big plays, but Bama’s strength is stopping the run, ranked number 2 in the nation at doing so. That is another key in this game, if Mizzou cannot run it, and have a below average passing game, how do they stay close unless Alabama turns it over 5 or 6 times, and that is highly unlikely. At days end I would not call this a total mismatch because no team gets to the SEC Title game by accident, but Alabama is battle tested against the toughest teams in the SEC and Missouri is not, and the pure physical nature of Alabama and speed at skill positions, along with the fact Nick Saban knows how to win championships and Gary Pinkel has yet to win one also plays a role. I think the inconsistencies in Missouri’s team will get exposed against a superior team on Saturday Night despite the fact they have rightfully earned this chance at redemption from last year’s loss in this same game. The Tigers will come in with their ears pinned back with nothing to lose and that is always a dangerous team to contend with, but Alabama is flat out better and poised for a national title again this year. I doubt Alabama shows up flat here and will not take Missouri lightly, and at days end I think they pull away late and not only get the win but the cover.